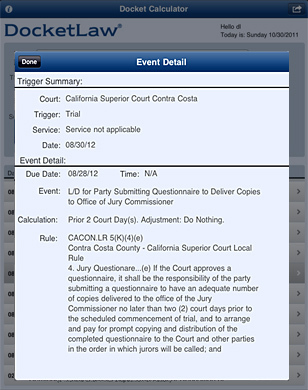 DocketLaw - Calendar Tools for Litigators | Court Rules and Deadline Calculator for iPhone and iPad. 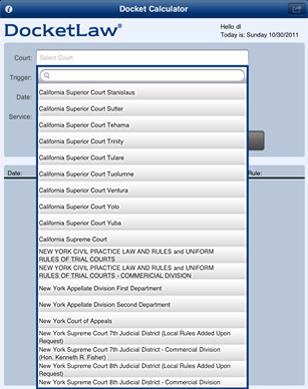 Apps for Lawyers. 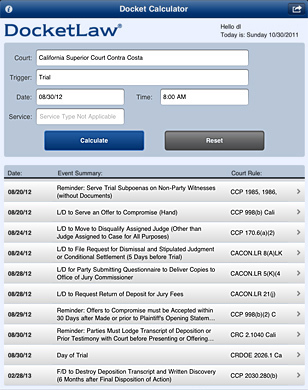 Calculate court deadlines without expensive legal software. 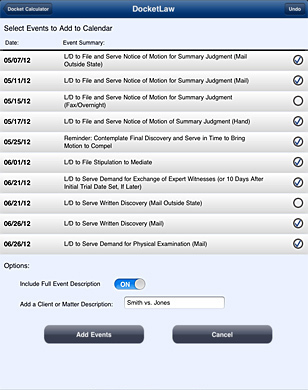 Missed court dates and deadlines are a leading cause of legal malpractice claims. The process of calculating, recalculating, and double-checking due dates can take valuable time and cause much angst for lawyers, paralegals, and docket specialists. While legal software solutions for calculating and calendaring court dates can reduce this risk, the high licensing and maintenance costs makes them unsuitable for most small law firms and solo practitioners. 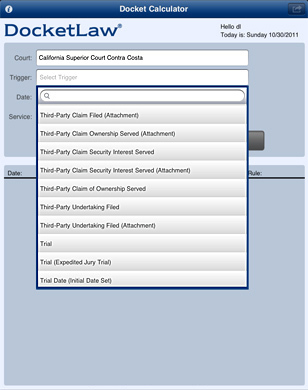 DocketLaw changes the game by putting accurate, rules-based, docket calculation and calendaring right within your smart phone, tablet or browser. Affordable monthly pricing and up-to-date coverage in over 300 courts in over 30 states, gives you the flexibility to purchase only the states and courts you practice in. Get started immediately without any annual contracts, IT hassles, or hidden fees.